South West France: an area of gastronomic delight! Even a Michelin Star restaurant! As we discover the delights of the area ourselves I will add more to this section! But needless to say there is a plethora of gorgeous and typical restaurants and cafes in the area - not to mention our very own Michelin Star restaurant 10 minutes away: Les Fresques. In St Foy la Grande itself we have a number of delightful often family run restaurants. 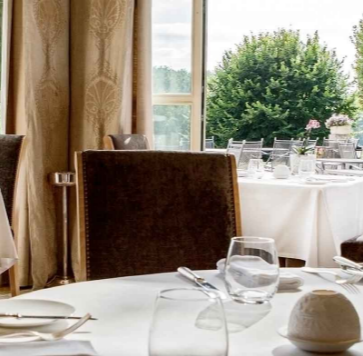 Famous for its fish and local produce Au fil de l'eau, is located on the river itself, just over the bridge and is recommended in the Michelin Guide. Le Victor is a simple and popular place, and opposite you will even find the local chinese! Coté Bastide and Brasserie Le Chai are also recommended as well as various eateries in Duras. The restaurants, often simple, serve the most divine food and at such reasonable prices. Children are welcome, and while chicken nuggets and chips are not likely to be on the menu, more simple options and smaller portions are available, and the fussiest of little eaters catered for! For the more adventurous truffles, fois gras, oysters all bound. Duck in all its guises is a speciality. Oysters and asparagus and of course the famous tomatoes from Marmande are all readily available and so full of flavour! Delightful Sucré Salée in St Foy and its coffee shop. The square in St Foy has a number of lovely cafes and patisseries nestled under the 13th century arcades, cool in the summer sun, packed on market day. You should visit Les Globetrotters cafe on the right where Alain, ‘le patron’ and his friendly staff will welcome you warmly. A typical French cafe inside, frequented by the French, the food is simple, tasty and generous. There is also good internet access here should you want to work from the bar as I do! In Bergerac Au Cèpes Enchantes and Le Bergerac are both favourites with us. Another wonderful find in St Foy La Grande is the delightful coffee and gift shop Sucré Salée on the main road. Filled with treats, gifts and interior design ideas it is beautifully furnished as a traditional "salon de thé" serving home made cakes on vintage china. It has a peaceful garden and also offers free wi-fi.